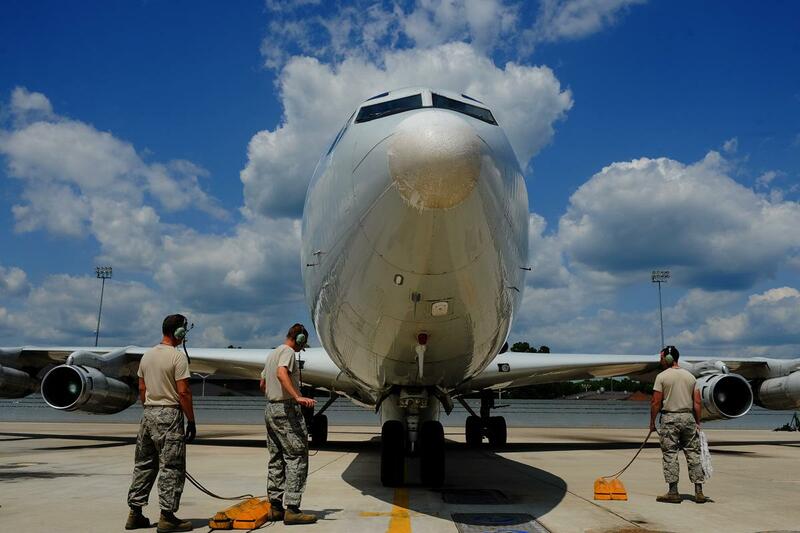 JSTARS aircraft crew chiefs recover an E-8C Joint STARS returning from a mission in 2012. In a provision of the 2018 National Defense Reauthorization Act signed into law by President Trump, more money would be pushed to the Advanced Battlefield Management System. That’s the still in development system of satellites and unmanned aircraft that will ultimately replace JSTARS. Unlike JSTARS, ABMS will give the military the ability to see into what they term “denied airspace,” or places an aircraft simply can’t fly close enough to see with radar and other high tech tools, places like China and Russia. In order to speed up development of that system, money will have to come from the JSTARS program. That means no replacement of 44-year-old aircraft and a planned sunset of that program in 10 years. Congressman Austin Scott of Georgia’s 8th District said not keeping the existing surveillance program on the cutting edge is a mistake. “If we only maintain JSTARS for 10 years then that would leave us with, we believe today, a seven-year gap in [surveillance] capabilities,” Scott said. Scott said he would prefer money for brand new JSTARS planes to keep that program running indefinitely until ABMS has jelled. Perdue contends once based at Robins Air Force Base, ABMS will mean more jobs there. But the new jobs will be focused on information technology and computer science, not the blue collar jobs of aircraft maintenance many civilian employees enjoy now. Scott said he has spoken with Secretary of the Air Force Heather Wilson about what the mix of jobs will be. If development of the ABMS system does not move ahead as hoped, Congress may revisit the JSTARS timeline.